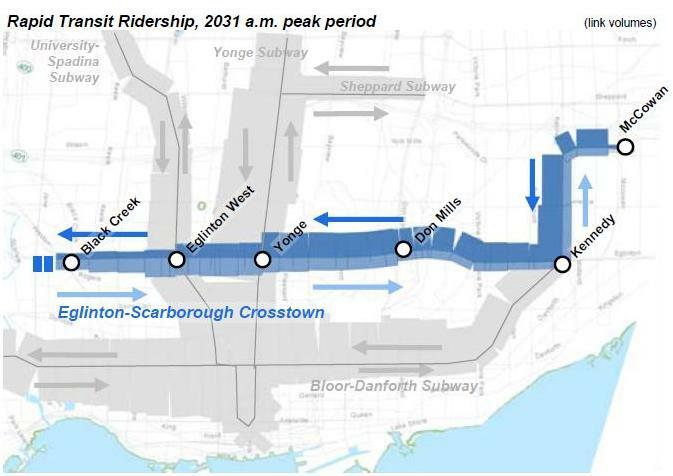 In a previous article, I discussed the Eglinton-Crosstown LRT subway and the issues raised by demand projections for it. On July 26, I met with staff from Metrolinx to explore the subject in detail, and this post summarizes our discussion. What Network and Land Use Drove the Demand Model? Before we can understand the numbers generated from any model, it is important to know the assumptions behind it. Is the network a realistic view of services that will actually be in place? What residential and work locations and densities are used to generate the travel demand flowing through the model? Notable by their absence from the map of passenger flows are any extension of the Sheppard subway, the proposed Richmond Hill extension of the Yonge subway and any reference to GO Transit routes or demand. Metrolinx replied that their model includes only those routes and services for which funding is committed. This means that only the Spadina Extension, the Eglinton line, and the GO improvements in GO’s 2020 plan are part of the model. In effect, this takes the transportation network to roughly a 2020 state. However, the underlying land use represents 2031 population and job projections with growth concentrated in major nodes such as Yonge-Eglinton and Scarborough Town Centre. How Does the Demand Behave? The projected travel time from STC to King & Yonge is the same whether a rider uses the Eglinton-Crosstown or the Bloor-Danforth line to reach the Yonge subway. Demand to downtown does not change much with the addition of the Crosstown line because it does not generate much new demand to downtown along its route, but only diverts trips that would otherwise use the BD path. Another way of looking at this is that modelled land use and demand to downtown stay the same in any simulation, and with the high modal split already seen in traffic bound to that area, a new transit line outside of the core will mainly redistribute this demand, not add to it. In the original Transit City network model, the projected peak hour demand westbound from Kennedy on Eglinton was 2,700. With the change to a through-routed Scarborough-Eglinton service and the higher speed of subway operation from Scarborough to Leaside, the peak hour demand goes up to 9,200. Of the 6,500 added riders, about 60% shift from the BD line while the remaining 40% come either from bus routes (people riding west to the Yonge line via, say, 54 Lawrence East or 95 York Mils) or from net new transit demand. Although demand will grow on the Yonge line, this growth will not come from Eglinton. Transfer movements will shift from Bloor-Yonge to Eglinton-Yonge, but the growth due to the Eglinton line’s presence will be small. Trips bound for midtown, by contrast, have a much faster route from Scarborough via the Crosstown, and these will shift to the new line. Indeed, some traffic bound for York University also moves north to Eglinton because of the more direct access to the Spadina subway. Metrolinx has tested the effect of a Sheppard subway extension, and if this is added to the model, demand on Eglinton-Crosstown drops by about 10%. They have not examined the effect of a Downtown Relief Line because the core area demand and capacity issues are part of a separate TTC study in progress. Similarly, any issues with Bloor-Yonge capacity and demands on the Yonge line generally are part of the TTC’s work. Metrolinx does not regard their simulations of this part of the network as definitive. Opening day demand on Eglinton is expected to be about 65% of the 2031 projection. Whether peak riding on the Crosstown will eventually plateau is difficult to say. This depends on what future network additions and/or changes in land use that are not part of the model actually occur. Because the peak demand is projected to be to the east of Yonge, less attention has been paid to travel behaviour to the west. With the line ending at Jane Street and without a feeder of comparable capacity to the “SRT” portion of the Crosstown, the western Crosstown segment will not achieve anywhere near the demand on the eastern side. Even an eventual connection through to the Mississauga busway would not provide the same feeder capacity as the Scarborough segment, and there are many alternative routes from Mississauga to downtown via GO. By contrast, the only change to GO east of Yonge that would be in the modelled network would be all-day service on the branch to Stouffville proposed in GO’s 2020 plan, and there is little in the network to compete with the Scarborough-Eglinton line for downtown-bound trips. What is quite striking about the projected demand on the east side of Yonge is how this continues the pattern of “commuter subways” whose passengers mainly originate at the outer ends of the lines thanks to collector services and major interchange nodes. In the model, this is a direct result of the land use assumptions that include little growth along Eglinton. Indeed, it begs the question of how much stimulus to anything other than relatively small clusters of condos the line will generate on a local basis. This chicken-and-egg situation and the relationship between land use and demand projections is an important part of the larger discussion of network planning. Is the land use model valid and appropriate? Will growth actually occur where it is planned? How much would growing population or jobs along the line affect demand, or would the very large downtown node and travel to it always dominate flows in the network? How far away from downtown must a rapid transit route be before travel locally on the route and to destinations outside of the core will dominate? What level of transit service, what density of well-served routes is needed to address the less concentrated demands for suburban travel? Can growth outside of the core actually be well-served by transit, or will this growth primarily contribute to increased auto travel? Metrolinx is in the early stages of “The Big Move 2.0”, a fresh look at the regional transportation plan, and yet many questions about the heart of this network are still very much local issues. Planning for the core area is in the TTC’s hands, although GO is also an important component. Many of the projects needed to achieve capacity growth on the subway are not funded (leaving aside the wisdom of each component or of alternatives such as the DRL). Projected GO rail volumes in “TBM 1” are considerably higher than the capacity of Union Station and of the rail corridor. How much of the anticipated growth in downtown can actually be handled by transit regardless of who operates it? What will be the role of near-downtown residential development and of the surface transit network? Reverse-peak commuting is a fact of life on the road network, and will become much more important for transit operations where the modal share of trips is now quite low. What are the implications of this trend for regional plans and for local transit operations? For all its size and eventual importance, the Eglinton-Crosstown line is only a small part of a much larger network. Its value as a construction project is impressive, and its billions will pad out claims of government spending on transit for years to come. Much more is needed, and an all subway all the time policy is not viable. This is the conundrum of the subway versus LRT (and BRT) debate. We need many transit routes, not just one showcase line, and demand pressures are far worse for the hard-to-serve travel to and between the suburbs. I was going to say Kitchener, but I remembered that there is now talk of making GO train service a higher priority then their LRT. At first, this sounds like a good thing because the Bloor-Yonge station is badly overcrowded and this takes some of those passenger transfers north to Eglinton-Yonge (assuming that station will be able to handle the movements). Then it occurs to me that the demand south of Bloor is the NET of those who now join at Bloor and those from north of Bloor who exit at that point (to head east or west, or just exit the TTC at that station). With the Eglinton line in operation, southbound trains between Eglinton and Bloor will have to carry passengers that used to join at Bloor IN ADDITION to the passengers who would be making some room for those boarding at Bloor. Is not this part of the line already bursting at its seams?!? Steve: You’re not supposed to ask embarrassing questions like that. One big problem with Metrolinx demand modelling is that they studiously ignore the part of the network where the problems are most severe. Following up on a question I made in the last thread (about Toronto-Mississauga commuting) and your response, has Metrolinx ever talked about improving connections between regions? Is there any way to accurately study (short of a voluntary survey) commuters’ points of origin and destinations so as to re-organize local and regional routes to serve actual demand? They keep talking about hubs here and there, and that’s great, but that only really works if a route useful to you goes to and leaves from that hub. Additionally, I wonder of Presto could be just the sort of tool that makes this kind of data easy to acquire. With each card’s being tied to a unique PIN or whatever, they could theoretically track every distinct path of ‘taps’ any given commuter makes routinely, and use that to build an accurate map of actual transit usage, and then tailor projects such as transfer points and route planning accordingly. This system would, by necessity, be a bit behind reality (being reactive in nature), but it really could lead to better transit planning. Steve: This kind of info is already available in the Transportation Tomorrow Survey that is conducted by the UofT on behalf of provincial and municipal planning agencies. You don’t need Presto to know on a large scale where people are travelling. Note also that Presto will tell you only where existing transit riders are travelling, not commuters and other travellers in general. Do you find their model pays much attention to the Official Plan objectives for Eglinton East or are they essentially rolling their own projections? Steve: We didn’t get into the details, but the fact that they concentrate development at major nodes suggests that they are out of sync with the O.P. This was a bone of contention between the City and Metrolinx in the Transit City days because very different results came out of the City/TTC modelling. Steve, was “King and Yonge” the presumed destination of all the downtown-bound trips in Metrolinx model, or is it just an example? Steve: Any demand model is broken up into zones, and “King and Yonge” is a surrogate for the heart of the core area. As long as the trips originate far enough away, there is no real difference between Yonge and Bay, or King and Front, or the nearby areas. I’m not 100% certain which way the decision would go. It may even change from time to time in reaction to bad experiences. However, the choice might change if, for example, the STC-originating rider wants to go to someplace on the Bay bus, or down Spadina, or to the Bloor-Yonge area. For all these cases, barring the invention of the DRL, I would surely opt for the seat choice on a Bloor-Danforth train at Kennedy, over riding the Yonge line. Someone working at Eglinton and Yonge would take Eglinton-Crosstown, whether in the Transit City network or the Crosstown-SRT setup. This leaves whatever’s between Eglinton and Bloor, and other than St. Clair and Yonge, there isn’t really a whole lot. Steve: The model is not “capacity constrained” and does not take into account the relative comfort of the chosen links in a trip. Steve: I am chortling away imagining Rob Pritchard as The Great and Powerful Oz himself. I think that under this Metrolinx model, without any significant improvements to transit capacity in the downtown core, that employment and residential growth outside the downtown core will dominate. If the subway lines south of Bloor are at capacity, then employment growth in that area will be low. It does not make sense that employers will locate their offices in an area where the subway system is severely overcrowded, and I suspect that the opening of the Eglinton line will cause the Spadina subway to finally reach crush load capacity as well due to whatever growth in downtown does occur. A downtown relief line and/or a major expansion of Union Station are required to keep downtown from stagnating. To the extent that there is significant employment growth in Toronto (and this depends on lowering commercial property taxes to be more competitive with the 905), I think that most employment development in Toronto will happen outside of downtown because of the overcrowding of the subway system downtown, and because land costs are lower outside downtown. Residential and retail growth will follow job growth. I predict that Yonge & Eglinton will become a major area of growth (more than Metrolinx predicts), and transit will have a high mode share there due to the low road capacity in that area. Significant growth will occur along other points on the line as well, particularly Eglinton/DVP and Scarborough Centre (which already have significant numbers of jobs already) but auto market share will be much higher in these areas due to the presence of a highway. North York Centre should benefit somewhat from an Eglinton subway, and will benefit more if a Sheppard subway is built and/or the Yonge subway is extended, but again the presence of the 401 will reduce transit market share. Still a lot of growth will occur away from the subway lines, much of it in the 905, and will continue to be heavily car oriented. Steve: Don’t forget that much of the employment growth of the past decades downtown has been supported by growth of GO Transit and more recently by new residential population close to the core. The problem with the Metrolinx model is that it does not take into account the potential role of GO within the 416 because of the limited changes to the modelled network that could support this type of travel. Don’t forget that much of the employment growth of the past decades downtown has been supported by growth of GO Transit and more recently by new residential population close to the core. The problem with the Metrolinx model is that it does not take into account the potential role of GO within the 416 because of the limited changes to the modelled network that could support this type of travel. The high cost of downtown condos (due to high land costs) limits the extent to which condo growth downtown can support employment growth. A 2 bedroom condo in a new building downtown can easily cost $500k or more, which is cost prohibitive for most families, so most people who live in downtown condos and walk to work are childless. Condos in the suburbs are much more affordable ($350k-$400k for a 2 bedroom), and many people desire houses. If it is difficult to commute downtown from the suburbs employers will not locate downtown. Certainly GO Transit expansion will help downtown employment growth a lot, but unfortunately these improvements remain unfunded so far. Steve: The condos may be pricey, but it is a fact that the proportion of commuters entering downtown on foot or on bicycle is growing. You don’t need to live at King and Yonge to be in a “downtown condo”. Even if Eglinton plus B-D usage stayed the same, the additional E-W capacity means these people will be delivered to the Yonge line in a compressed time-frame. The usage bell curve becomes narrower but taller. I hope someone is thinking of a 2nd platform on the Yonge line’s Eglinton station a la Union because we’re going to need some queuing room. Steve: No, actually, they are not. The current plan brings riders up to the existing centre platform from the new line below. There isn’t enough room to thread the Eglinton route above the Yonge line without hitting pedestrian tunnels and utilities. Steve asked: How far away from downtown must a rapid transit route be before travel locally on the route and to destinations outside of the core will dominate? Steve asked: Can growth outside of the core actually be well-served by transit, or will this growth primarily contribute to increased auto travel? This depends largely on municipal planners’ approach to road layouts. Will suburbs (including the inner suburbs, although they’re pretty much built now) stop building isolated communities that cannot efficiently have transit service provided to them? Will suburbs be prepared to make difficult decisions to make “small”-but-strategic changes to road networks in existing neighbourhoods to improve the situation? More suburban subway extensions aren’t around the corner (and they’re not sustainable at any rate). Steve: The one additional factor is the dispersed nature of suburb-to-suburb travel and the challenges this creates for transit network and service design. I don’t feel that the line can truly be called “crosstown” because of the fact that, at least for phase 1, it will only reach Jane St. BD is much more deserving of such a name. I can just hope that, like BD, phase 2 will come quickly, and that 25 years after completion and opening, Jane St. still isn’t the western end. As someone who’s lived far in the West End near The East Mall/Burnhamthorpe all his life (25 years tomorrow) and never once with a car, I’ve often felt this is one of the least studied areas for RT improvements, and not many people seem to talk about it very often, not even on this fine website. (Though I don’t believe it’s intentional on your part, Steve) I would love the option of having either Bloor or Eglinton subways to get downtown (we all know who to thank for cancelling that), and it would sure take some pressure off BD for people coming in from Peel. And of course, unless one has seen it for themselves, the situation on Finch West is a nightmare. Bunched buses, near-useless time schedule, MASS overcrowding, etc. Even during off hours this is the norm, not just rush hour. And despite the many routes, in the 20 minutes I waited at Finch Station earlier in the week, only 1 bus came by, the 36D, and this was rush hour. And not everyone could get on. How Sheppard can get priority over Finch baffles me. P.S. Really enjoy the site, keep up the good work. Clearly Metrolinx hasn’t been talking to the frères Ford. Special development taxes along Eglinton will pay for the Sheppard subway. So there’s gotta be lotsa development to be taxed along Eglinton! At the same time, current demand for the route is based on a bus operating in mixed traffic vs. an LRT on its own ROW/underground which can operate more effectively. Even with a car, I try to avoid major routes like Eglinton – I’d be more likely to use the route if transit was separate then what it is like now. I’d assume others may get out of their cars if they are made to feel that the LRT will actually move faster than the traffic. Do you see the Eglinton Crosstown Line performing much better than the Shepperd Stubway? The model is not “capacity constrained” and does not take into account the relative comfort of the chosen links in a trip. This is a major weakness in the model. I assert that there is considerable pent-up demand for the Yonge subway during peak hours. And that far more people would take a more comfortable trip that does not involve being crammed in like sardines in a can and women being “accidently” sexually touched with the lurching of the train. If Metrolinx assumed GO Transit improvements for 2020, why do they not show any GO transit on the map? Do they consider the demand carried by GO 2020 to be negligible compared to TTC routes? Steve: The GO improvements planned for 2020 have almost no effect on the catchment area of the Eglinton line, especially on the east side of the city. Also, can you remind me exactly what improvements MoveOntario 2020 would bring? Although there would be all day service on some lines, that might not contribute to more capacity during peak periods (although that’s a discussion for your “Union Station” post). Steve: You can read about MoveOntario 2020 on my site, or many other locations. Google is your friend. When you look at the project list, you will see among other things a long list of Toronto LRT lines, and electrification of the Lake Shore corridor. Does this document still have any relevance? If the DRL were build as a direct-to-downtown branch of the Eglinton-Crosstown line, what ramifications would you expect for demand on other lines? Would this be feasible or desirable? Steve: Demand on Eglinton east of Don Mills would go up a bit, demand west to Yonge would fall off because the downtown component of the Eglinton line’s riding would be intercepted. There would be a drop in demand on Yonge, although this would backfill with folks from further north. Having said that, I don’t think it’s a good idea. We need to stop tailoring routes to only serve downtown, and Eglinton needs a through east-west service. Also, integrating the lines would pre-empt sending the Don Mills service further north. I think the model should include people who would stop taking transit and start driving, because they do not like the transfer at Kennedy and the slow speed of the BD subway. You guys have to remember that transit must compete with the auto. Many people stop taking transit in Scarborough the minute they can, because they are tired of needless transfers and long travel times. The Eglinton line addresses this issue to an extent, and in building for the future, it is going to be a total success. Toronto will look back on this decision as a great one, when the fad of light rail and no subways ends. We already are living with the legacy of the SRT being built, because there was no demand for a subway. And now years latter planners are saying the subway should just have been extended, as the demand is there. We must think to the future, and of changing travel habits. And the Eglinton subway will do that. Steve: Once upon a time, when there were sheep grazing in northern Scarborough, an LRT line to Malvern was proposed. At that time, there was no possible way a subway could have been justified, but an LRT line would have connected Scarborough far better to the subway system. We didn’t build that line because Queen’s Park was too busy pushing their high tech dreams down our throats, and we could barely afford to get to STC, let along any further. If we had started building an LRT network in the 1970s, yes we might now have corridors where conversion to a full subway might, and I emphasize “might”, have been justified. The LRT platform at Kipling Station, vacant since the line opened, could have had service west into Mississauga and north to the airport. Instead we have nothing. That’s what happens when the only alternative on the table is subways, or something equally expensive. For a long time, that’s what I (along with many SkyTrain advocates in Vancouver) preached as well. However, it is unrealistic to expect that transit can ever compete with the automobile in a car-centric sprawled city. Those who believe otherwise are, frankly, delusional. The reason why I continue to believe that LRT and streetcars are still the way to go is that they will bring improvements to existing transit users, while changing Toronto’s cityscape into a transit-oriented one. Only then can transit compete well for trips. While Metrolinx keeps mentioning an “average” number of passengers on each segment how will the existing model handle major surges? The Crosstown will connect to four GO transit lines, with trains that carry 1800 passengers each. Assuming only 10% are headed to various locations in midtown (that’s very conservative as land use along Eglinton is likely to intensify over the next decade) you have two hundred people trying to board a small LRT train which is already 70% full at Kennedy. Same issue with Richmond Hill GO connection. This is not likely to be an issue west of Yonge as the Mississauga busway passengers will arrive in smaller vehicles and overall demand is lower. How realistic are 90 seconds headways on that line, will we be able to afford so many trains? If not are large waiting areas being considered on busiest stations? As a longtime 501 commuter I hope that TTC won’t resort to short turns to manage the peak AM demand between Kennedy and Yonge. Steve: I suspect your 10% figure may be high, but, yes there will always be problems where higher capacity modes meet lower capacity ones. Just think of the meet between the Yonge subway and the Eglinton line where passengers from Yonge trains will arrive every 60 seconds (both directions) with a goodly number transferring. The detailed design of the new interchange will be important for the capacity of moves between the lines it can support. You mention that Metrolinx omitted GO transit improvements/expansions that are beyond 2020, which would leave out lines such as the Agincourt-crosstown line. But the original Transit City EA for Eglinton also leaves this out too. (They also fail to mention the Stouffville Line improvements, but I’m guessing that they already included this as an existing part of the network). I had thought that the dominant reason that Metrolinx (and other subway-cheerleading studies of the past) projected subway-level ridership was because of the omission of competing lines. Steve: TTC has a long history of doing demand studies that omit the potential shifts in demand through improved commuter rail and models that load long-haul traffic onto the subway system because it has nowhere else to go. That was a big flaw in the Sheppard Subway studies years ago. On Eglinton, the situation is a bit more subtle. Metrolinx’ demand model is very sensitive to speed of travel, and if the Eglinton line is modelled at subway speeds, the model diverts traffic off of the Danforth subway. This may or may not be a useful way to spend billions of dollars, but it was also amusing to see the TTC, until quite recently, continuing to predict the need for much more frequent service (and capacity) on BD even when other lines (including the DRL) might act as relief valves. The biggest problem is that we spend so much time planning, but so little actually building, that one is never quite sure what network should be fed to the demand models. Meanwhile, Metrolinx refuses to produce reports on anything beyond complete networks that we will never see, and whose demand numbers are not credible. The original EA’s for Transit City don’t seem to mention fare integration with GO Transit either. What I am most surprised (and perplexed) about is that the assumptions behind the future network aren’t very different between the Transit City and Metrolinx. Furthermore, Transit City also applied a 2031 population in its model as well. And yet, Metrolinx continues to yield a much greater number than Transit City, even when they do consider the Sheppard Subway. You mention that Metrolinx has a habit of ignoring local travel. I interpret this to mean that Metrolinx assumes that all passengers are attracted to express higher-speed service. Does Transit City believe that there would be some loss in ridership if the service is not local enough and “too fast”? Steve: “Too fast” also implies stations are far apart, more like the North Yonge subway than the proposed layout of the Transit City lines. The wider spacing limits the usefulness of the service for local travel, especially when you add in the extra time needed to access stations that are not at grade. This gets down to the basic question of why we are building the network — for long haul express trips or for locals or for some combination. Furthermore, Transit City also says that increases in speed would only result in modest increases in ridership. This is clearly a contradiction to Metrolinx’s forecasting results. Steve: Different models and assumptions. For relatively short trips such as are the kind found on the TTC, access time and service frequency contribute more to overall trip time than speed. For example, it takes about 12 minutes for a train to get from Finch to Eglinton (about 8km), and the next 12 minutes will get you to somewhere around College or Dundas unless service is badly backed up at Bloor. That’s say 5 km. However, someone who is not at a station north of Eglinton faces a considerable access time just to reach a train. Why, after all, did they put in North York Centre Station if a 2km spacing was fine for everyone else? Because it was a really dumb idea to have a major destination 1km away from subway service. Yes, the speed north of Eglinton is almost twice the speed south of it, but I would argue that the old part of the line provides better service to the more dense “old” city. Out in the suburbs where the density is lower, there is still a comparable problem in that potential traffic origins and destinations are smeared out along streets like Sheppard and Finch. Stopping every few km will leave a lot of gaps. As things stand, I expect to see quite a debate about whether a Sheppard Subway extension will include a Consumers Road Station or if it will be dropped to save money. Does that mean that Transit City projected a higher peak ridership on the BD line than Metrolinx? Steve: I don’t think Transit City considered the effect on the BD subway as it focussed on riding within each route’s corridor, but, yes the Transit City projections, if they looked at BD at all, would not have projected as much of a decline in demand because the BD line would still be the more attractive route from Kennedy to Yonge and Bloor. Is STC and Yonge-Eglinton Centre the only nodes Metrolinx considered growth at? I’m guessing that in order to keep the passenger turnover rate low (and allow the peak volumes to accumulate easily in order to justify the subway), growth and development would have to be suppressed at many locations along Eglinton, and let the STC and Yonge-Eglinton Centres take the remaining development. Steve: I don’t know the fine details of Metrolinx’ demand model and land use, but it is supposed to be based on plans and projections of the various municipalities over the next 25 years, not a gerrymandered arrangement to make routes look good. From talking to their staff, my impression is that it is the higher speed of an “express” Eglinton line that inflates the numbers by diverting modelled trips off of BD. Also, Peter Milczyn released a report, which may be related to the land use plan along Eglinton (though not explicitly mentioned). Even though he mentions the importance of “Nodal” development around stations only, if there were enough development nodes then it wouldn’t be all that different than the current Official Plan’s “Avenues”. Steve: That report is rather simplistic in two ways. First, it assumes that all demand comes from development on a line, but as we have discussed here many times, demand can also arise from connecting services and from desire lines for major groupings of trips (e.g. commutes to downtown) falling along a corridor which is not itself heavily developed. Case in point: BD subway. Second, it trots out that old chestnut about Hong Kong, but papers over the very different land ownership arrangements there where the public sector holds all the cards. It’s easy to have “transit oriented development” when you own all of the land and can dictate how it is used, and when the population density is such demand for transit happens almost without effort. On a much smaller scale, the TTC mistook its successes of the 60s and 70s for enlightened planning when the explosive growth of the suburbs more or less guaranteed them a market with little effort.